​Every year during the last week of January, along with the rest of the nation, the Wayne County Housing Coalition conducts a Point-In-Time count. The U.S. Department of Housing and Urban Development (HUD) requires that communities receiving federal funds from the McKinney-Vento Homeless Assistance Grants program conduct a count of all sheltered people. Unsheltered counts are required by HUD every other year, but in Ohio an unsheltered count is conducted annually. Data from the last five years is outlined below. The findings below show that the 2015 was the lowest number of people found to be homeless on the PIT count evening and 2013 was the highest number of people counted. 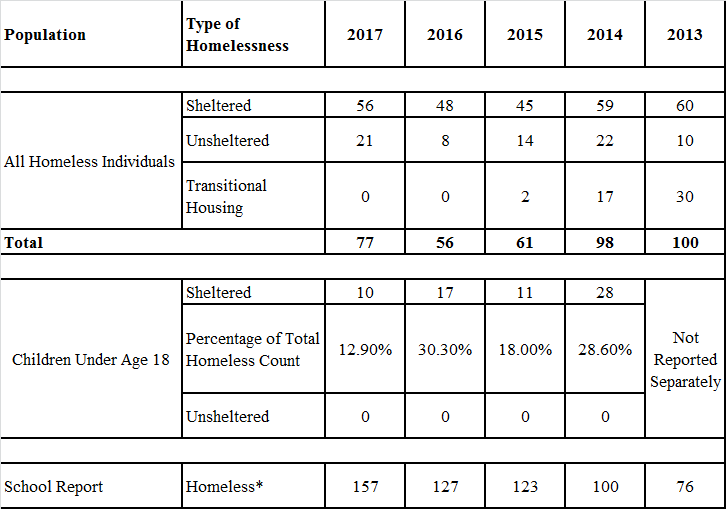 In 2015 there was a 37.76% decrease in homelessness from the 2014 PIT count, but in 2017 while there was a 37.50% increase in homelessness from 2016 PIT count the overall count from 2013-2017 is trending downward by 23%. PIT count information is used to identify local housing issues is also needed for state funding applications. The PIT data also helps with planning, prioritizing programs and services, as well as identifying gaps in the local continuum of housing stock and supportive services. Over the past four years the Coalition has tracked the number of children identified as homeless in the annual PIT counts. No children were identified in the unsheltered counts, but children made up an average of 22.6% of the individuals included in the sheltered count which is a concern. Additionally of concern is the increasing numbers of homeless youth reported by the schools. Schools use a less strict definition when counting homelessness and the data collected has shown a substantial increase in the number of homeless over the past five years. The Coalition’s work with the schools has helped provide a better overall picture about the housing situation of our youth and families, but it is hard to gage whether this is due to better data collection/ reporting or an increase in the number of families lacking a fixed, regular, adequate nighttime residence or that are doubled up with other households. ​* Definition used to define homelessness in schools is “lack of a fixed, regular, or adequate nighttime residence”. Doubled-up can be counted in school homeless counts.